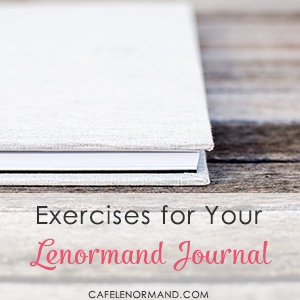 Looking for Lenormand exercises for your journal? Want some fun activities to help you get to know your cards better? Here are simple Lenormand exercises you can try out to help you get accurate answers to any question or situation. Bibliomancy is a traditional divination technique where you ask a question, and open a book randomly to find your answer. You can apply bibliomancy to Lenormand by turning it into an exercise where you spread the cards out in front of you, ask your question, and pick a card at random. Write down your question, the card you drew, and your interpretation in your Lenormand journal. Feel free to add more cards to practice reading Lenormand combinations or different Lenormand spreads, even the 3×3. This is a nice, simple exercise you can do in the morning while sipping your cup of coffee or eating your breakfast. Pick 3 cards about your day that lies ahead. Journal about what you think they mean. Be on the lookout throughout the day to see how the cards come about. You can also try this Lenormand exercise in the evening to see what the cards have to say about the day you had. What should I binge watch this weekend? The Tower could be “Law & Order”. The Coffin could be “Game of Thrones”. Enough people die on it that coffin making must be a booming industry! The Man/Woman could be the “Bachelor” or the “Bachelorette” respectively. The Book could be Harry Potter movies. The Lily could be “Lilies of the Field” – great movie if you haven't seen it. Who will win “The Voice” this season? Will the Kardashians ever be cancelled? What new program should I add to my TV watching schedule this season? Try this New Year Lenormand Spread. I created this spread to do at any turning point in life. It combines Tarot and Lenormand, and is a great way to see how the decks work together and how they give you different information. It's a great way to look at where you are in your life now and figuring out what you should focus on or be prepared for in the months to come. Get a professional Lenormand reading. Make notes in your journal about any insights you pick up about card meanings, combinations, or reading techniques the reader used. Write down if you liked their advice or how they communicated the cards' message. Is there anything you can use in your future readings? What should I get my mother/father/brother/sister/partner for their birthday? What mattress should I buy for my bed? What shirt should I get for my job interview? What should I buy to wear on my date? What lamp would work best on my desk? Where should I go shopping for the best deals? Make a list of your friends and family. You can ask the cards what card best describes your friend or family member. Pick one card and see how well it matches. You can also do various Lenormand exercises for each friend or family member by asking what they need from you or how you can improve your relationship. You could do your pets too! Now it's time for you to start journaling your Lenormand exercises. Do you have any other exercises you'd like to share? Have you tried any of these Lenormand exercises? What is the Best Spread to Learn Lenormand?